Boisrame and Guyon Score Wins in Switzerland. 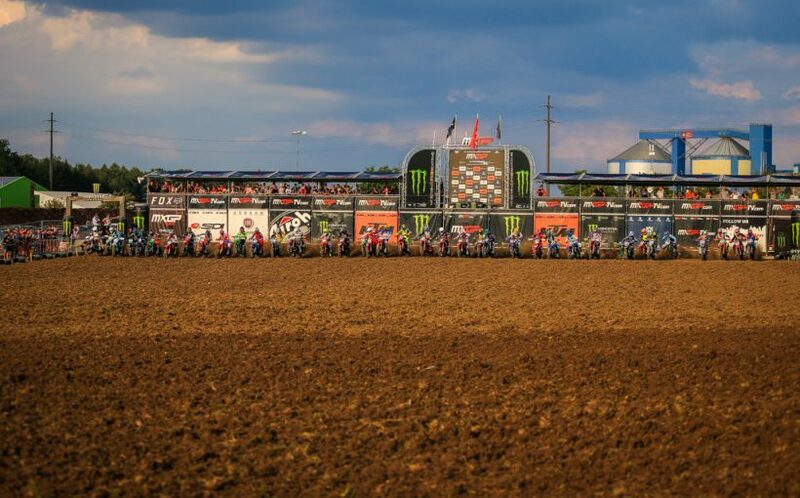 The FIM Motocross World Championship was joined by the European Championship races of EMX125 presented by FMF Racing and EMX250 where Team VRT’s Tom Guyon and Honda RedMoto Assomotor’s Mathys Boisrame took the respective overall wins. Played out over 2 days the EMX racing started with Time Practice and Last Chance Races to narrow the fields down to 40 riders each. Following the Qualifying was the first points paying races on Saturday starting with first with EMX125 presented by FMF Racing Race 1 immediately by EMX250 Race 1. In EMX250 the race was first led by the round 1 winner in RedSand, Spain, BUD Racing Monster Energy’s Pierre Goupillon. Goupillon quickly lost the lead to Team DIGA-Procross’ Dylan Walsh and the lost another spot to Honda RedMoto Assomotor’s Mathys Boisrame. Walsh dealt with pressure from the red plate holder Boisrame on his Honda but the #172 fell on lap 2. Goupillon was back into 2nd but his BUD Racing Monster Energy Teammate Brian Moreau took the spot on lap 8. REVO Husqvarna UK’s Mel Pocock was in 3rd for 3 laps after starting 4th but then dropped back 9th to finish the race. Michael Sander was in 4th until the last lap when he was passed by both Boisrame and Yamaha SM Action MC Migliori’s Maxime Renaux. At the finish line Walsh scored the race win with Moreau 2nd, Goupillon 3rd, Boisrame 4th, and Renaux rounded out the top 5. Today’s Race 2 started well for Mathys Boisrame who found himself in the lead by the end of the first official lap. Race 1’s winner Dylan Walsh was second for the first 3 laps recorded before Apico Factory Racing Honda’s Steven Clarke took the spot. WZ-Racing’s Jeremy Sydow was 4th before Josh Spinks took the position away on the same lap that Clarke took second from Walsh. Spinks also took a position from Walsh along with several other riders. Moreau started the second official lap in 12th after his 2nd in Race 1. Moreau struggled to keep his bike upright and on two wheels falling multiple times throughout the race by miraculously managed to score a 7th. The race was won by Boisrame who also took the overall while Clarke and Moreau rounded out the podium. EMX250 Race 1 Top 10: 1. Dylan Walsh (NZL, Husqvarna), 30:23.888; 2. Brian Strubhart Moreau (FRA, Kawasaki), +0:00.184; 3. Pierre Goupillon (FRA, Kawasaki), +0:02.321; 4. Mathys Boisrame (FRA, Honda), +0:05.064; 5. Maxime Renaux (FRA, Yamaha), +0:05.971; 6. Michael Sandner (AUT, KTM), +0:06.404; 7. Steven Clarke (GBR, Honda), +0:06.585; 8. Martin Barr (GBR, Husqvarna), +0:07.353; 9. Mel Pocock (GBR, Husqvarna), +0:08.785; 10. Roan Van De Moosdijk (NED, Yamaha), +0:11.523. EMX250 Race 2 Top 10: 1. Mathys Boisrame (FRA, Honda), 29:45.388; 2. Steven Clarke (GBR, Honda), +0:05.312; 3. Josh Spinks (GBR, KTM), +0:08.950; 4. Roan Van De Moosdijk (NED, Yamaha), +0:19.030; 5. Jeremy Sydow (GER, KTM), +0:25.211; 6. Mel Pocock (GBR, Husqvarna), +0:26.846; 7. Brian Strubhart Moreau (FRA, Kawasaki), +0:30.580; 8. Martin Barr (GBR, Husqvarna), +0:33.292; 9. Filippo Zonta (ITA, Honda), +0:34.284; 10. Pierre Goupillon (FRA, Kawasaki), +0:34.455. EMX250 Overall Top 10: 1. Mathys Boisrame (FRA, HON), 43 points; 2. Steven Clarke (GBR, HON), 36 p.; 3. Brian Strubhart Moreau (FRA, KAW), 36 p.; 4. Dylan Walsh (NZL, HUS), 34 p.; 5. Pierre Goupillon (FRA, KAW), 31 p.; 6. Roan Van De Moosdijk (NED, YAM), 29 p.; 7. Mel Pocock (GBR, HUS), 27 p.; 8. Martin Barr (GBR, HUS), 26 p.; 9. Josh Spinks (GBR, KTM), 24 p.; 10. Maxime Renaux (FRA, YAM), 20 p.
EMX250 Championship Top 10: 1. Mathys Boisrame (FRA, HON), 299 points; 2. Mel Pocock (GBR, HUS), 281 p.; 3. Martin Barr (GBR, HUS), 246 p.; 4. Roan Van De Moosdijk (NED, YAM), 222 p.; 5. Steven Clarke (GBR, HON), 219 p.; 6. Dylan Walsh (NZL, HUS), 216 p.; 7. Brian Strubhart Moreau (FRA, KAW), 209 p.; 8. Maxime Renaux (FRA, YAM), 168 p.; 9. Pierre Goupillon (FRA, KAW), 163 p.; 10. Tom Vialle (FRA, KTM), 153 p.
EMX250 Manufacturers: 1. Husqvarna, 385 points; 2. Honda, 370 p.; 3. Yamaha, 315 p.; 4. KTM, 310 p.; 5. Kawasaki, 273 p.; 6. Suzuki, 105 p.
EMX125 Presented by FMF Racing Race 1 Top 10: 1. Tom Guyon (FRA, KTM), 31:04.440; 2. Rick Elzinga (NED, Yamaha), +0:06.662; 3. Mattia Guadagnini (ITA, Husqvarna), +0:07.471; 4. Raivo Dankers (NED, KTM), +0:10.661; 5. Thibault Benistant (FRA, Yamaha), +0:11.422; 6. Mike Gwerder (SUI, KTM), +0:11.627; 7. Petr Polak (CZE, KTM), +0:14.300; 8. Lion Florian (GER, KTM), +0:19.718; 9. Filip Olsson (SWE, Husqvarna), +0:22.438; 10. Florian Miot (FRA, KTM), +0:24.699. EMX125 Presented by FMF Racing Race 2 Top 10: 1. Mattia Guadagnini (ITA, Husqvarna), 31:04.748; 2. Tom Guyon (FRA, KTM), +0:04.353; 3. Kjell Verbruggen (NED, KTM), +1:06.779; 4. Rick Elzinga (NED, Yamaha), +1:11.840; 5. Mario Lucas Sanz (ESP, KTM), +1:18.000; 6. Mike Gwerder (SUI, KTM), +1:18.593; 7. Thibault Benistant (FRA, Yamaha), +1:19.573; 8. James Scott (NZL, KTM), +1:25.774; 9. Mirko Valsecchi (ITA, KTM), +1:34.807; 10. Petr Polak (CZE, KTM), +1:45.094. EMX125 Presented by FMF Racing Overall Top 10: 1. Tom Guyon (FRA, KTM), 47 points; 2. Mattia Guadagnini (ITA, HUS), 45 p.; 3. Rick Elzinga (NED, YAM), 40 p.; 4. Mike Gwerder (SUI, KTM), 30 p.; 5. Thibault Benistant (FRA, YAM), 30 p.; 6. Raivo Dankers (NED, KTM), 28 p.; 7. Mario Lucas Sanz (ESP, KTM), 25 p.; 8. Petr Polak (CZE, KTM), 25 p.; 9. Kjell Verbruggen (NED, KTM), 22 p.; 10. Filip Olsson (SWE, HUS), 20 p.
EMX125 Presented by FMF Racing Championship Top 10: 1. Thibault Benistant (FRA, YAM), 235 points; 2. Rene Hofer (AUT, KTM), 202 p.; 3. Mattia Guadagnini (ITA, HUS), 196 p.; 4. Petr Polak (CZE, KTM), 170 p.; 5. Tom Guyon (FRA, KTM), 168 p.; 6. Raivo Dankers (NED, KTM), 151 p.; 7. Emil Weckman (FIN, KTM), 150 p.; 8. Filip Olsson (SWE, HUS), 134 p.; 9. Lion Florian (GER, KTM), 121 p.; 10. Raf Meuwissen (NED, KTM), 120 p.
EMX125 Presented by FMF Racing Manufacturers: 1. KTM, 325 points; 2. Husqvarna, 275 p.; 3. Yamaha, 245 p.; 4. TM, 15 p.